Bangkok is hot. Inescapably, incessantly, interminably hot. Even if you take refuge inside one of Bangkok’s air-conditioned malls, you’re going to have to face the heat sometime. What’s the best and most delicious way to counteract days with a low of 40 degrees Celsius? Ice cream. Lots of ice cream. 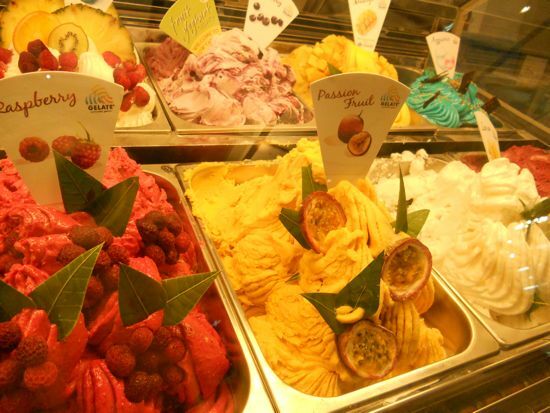 Or gelato for the Italians, and frozen yoghurt for the health-conscious. 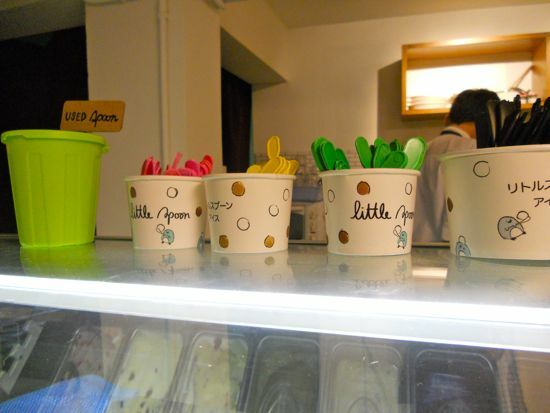 For an authentically Thai interpretation of ice cream, head to Café Little Spoon, which is just as cute as its name suggests. Enjoy homemade flavours like matcha and black sesame soy milk (1 scoop for 49 baht, two for 95 baht) while sitting in the café’s comfy seating area, or try their brownie cakes and milk shakes. For real gelato in Thailand, go to Grand ‘Italia, which has been around here since well before the gelato craze ever reached this side of the world. 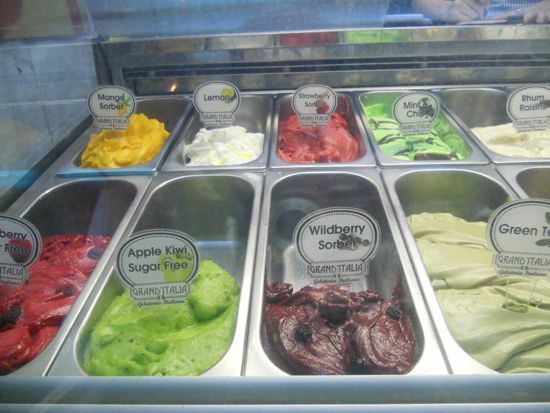 The three locations offer a large variety of flavours, like rum raisin, mango sorbet and sugar-free apple kiwi (a cone for 45 baht, a medium cup for 55 baht, a large cup for 65 baht). For “love at first scoop”, Gelate has an abundance of flavours with masterfully cut fruit on top; the raspberry sorbet is a work of art in itself (1 flavour for 45 baht, 2 flavours for 80 baht, 3 for 115 baht). Simply beauty at Melt Me. Melt Me, with seven locations in Bangkok, is in my humble opinion the best in gourmet gelato, and miraculously 100% fat free. Get a scoop of macademia nut and prepare to be taken to dessert heaven. Buddhi Belly get in my belly. Soft serve is little less prevalent in Bangkok than ice cream, but certainly not impossible to find. 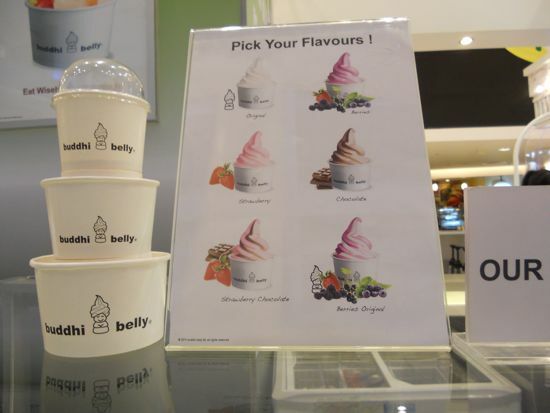 Buddhi Belly has consistently tasty and light froyo, with branches all over Thailand. The flavours change periodically (strawberry chocolate and mixed berry among the offerings), but its original flavour, which has the slightly sour taste of yoghurt, is always available. The best part of Buddhi Belly is the prodigal amounts of fresh fruits and granola they sprinkle on top (starting at 55 baht, 10 baht per topping). Freedom of flavours at Sfree. Sfree is by all accounts delicious, though slightly weird for the Western palette; sweet shaved ice, soft serve ice cream, and jelly. The dessert is sugar-free and 99% fat free (see: aspartame), a Thai calorie-conscious spin on the classic cold dessert nam kang sai. 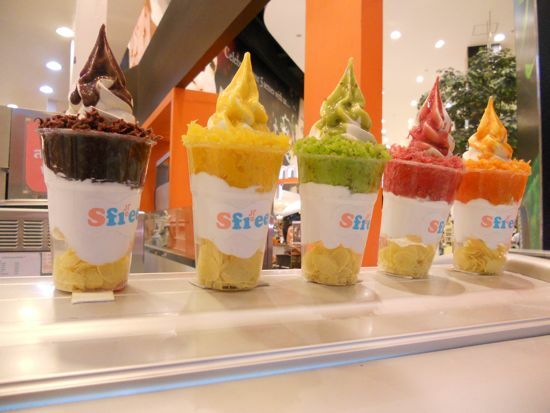 Sfree’s are in numerous Centrals, their newest location in Terminal 21 on the ground floor (parfait combinations starting at 90 baht). If you want to go international — ice cream may be a very generous term for what Swensen’s serves, but if you’re craving something extra sweet and easy to find, an outlet of the American chain may be your best bet. Thailand is home to more than 200 stores, all with the tagline, “America’s favourite ice cream parlour.” This claim is yet to be confirmed in America, but Swensen’s seems to be a favourite in Thailand, where many young Thai couples come to sit in the red booths and share banana floats drizzled in chocolate syrup. Swensen’s offers plenty of flavours, all seeming to gain their inspiration from candy and other desserts, like bubblegum and blueberry cobbler. 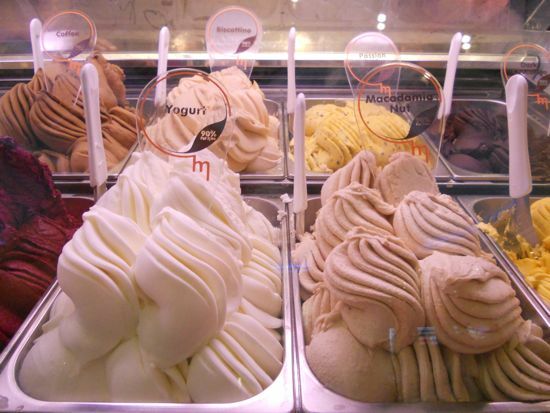 Only a select amount of stores offer frozen yogurt, so if you are calorie-conscious, head elsewhere. Baskin-Robbin’s is another American brand that has blown up in Bangkok, with a new franchise also on the Terminal 21 ground floor. Like Swensen’s, the ice cream makes no apologies for its sweetness, though the flavours are arguably more “natural” in taste… if strawberries n’ cream was an ice cream.